﻿ How fast does it go mister? Speed addiction has plagued humans since we first realised we could run. We’re fascinated by it, and the quest to discover who, or what, is the fastest. As soon as we’re sure we have the answer, another man emerges from a shed with something to beat it. As time passes, the stakes get higher, and the world’s motorcycle manufacturers get sucked in to a rapidly accelerating race for ultimate bragging rights. This search for speed has been ever-present, but really started to gather momentum in the 1980s with the birth of Kawasaki’s GPZ1100. It was the first king of the modern speed freaks, and was eventually supplanted by Kawasaki’s own ZZR1100 in 1990. The big Zed could hit 175mph in perfect conditions, and it started to look like Kawasaki had a stranglehold on the straightliners. The current iteration, the ZZR1400, lives by all the same rules and aspirations. It’s formidable, but is it the world’s fastest? Many consider the real king of speed to be Suzuki’s Hayabusa. Loved by drag racers worldwide, its launch catapulted it to the top of the speed race. 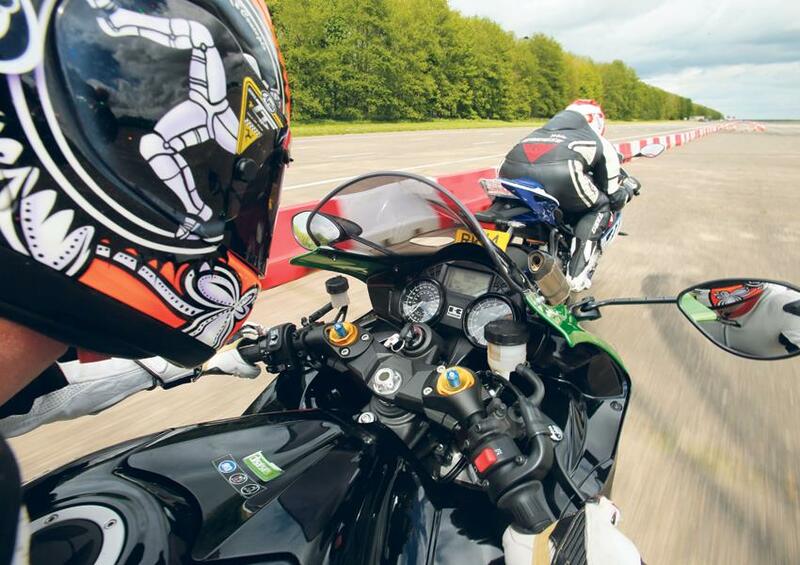 Tales of 200mph top speeds could be heard at bike meets. It all became academic as the major manufacturers took the initiative and governed their top speeds before some bureaucrat did it for them. The answer to the question ‘How fast does it go mister?’ became a default 186mph. In 2014 the landscape hasn’t changed too much for the hyperbike. Honda’s Super Blackbird has fallen by the wayside, joined there by Kawasaki’s ZX-12R, but the firm’s ZZR1400 and Suzuki’s Hayabusa are still finding new homes to infest with their speed-addled psychosis. 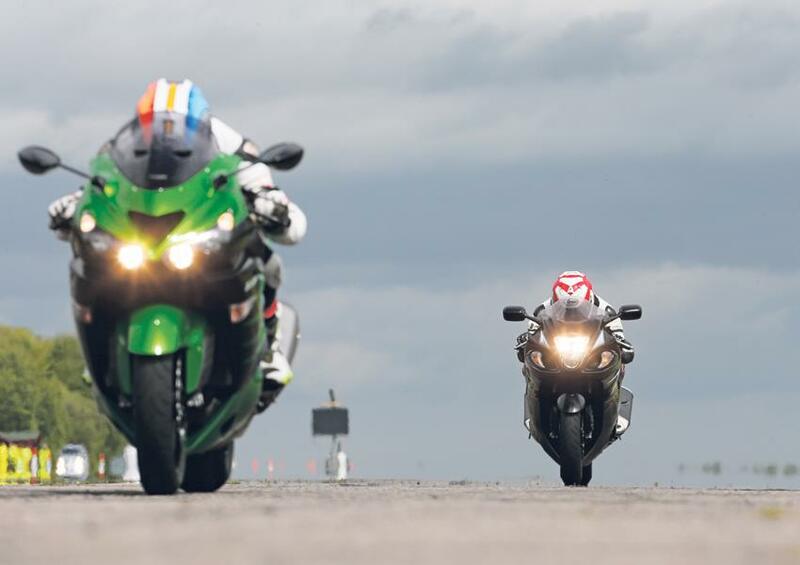 The pub debate has raged for years: which is quickest, the ZZR or Busa? But it’s no longer all about those two. 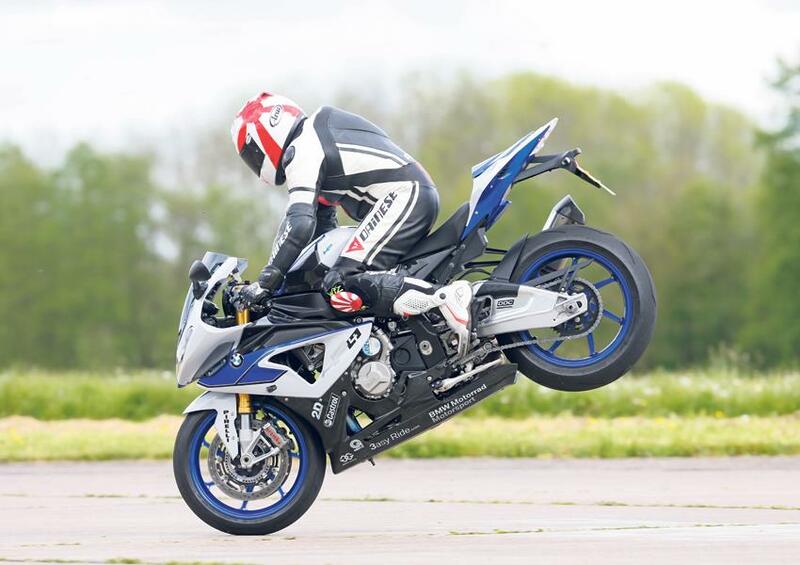 There is a more athletic pupil at the school of speed – BMW’s technologically advanced HP4. It’s won every test we have thrown at it so far, but can it play with, match, or even beat the big boys? There’s only one way to find out. I can hear some readers (most likely owners of one of the three bikes) screaming obscenities already. But the numbers below are the actual top-speed figures, measured scientifically rather than by snatching a sneaky peek at what the speedo is reading. Speedos might be good for pub bragging rights, but the onboard footage at motorcyclenews.com shows the speedos on these three bikes aren’t very accurate. While each bike is restricted to a manufacturer-agreed 186mph, only the BMW reaches a true 186mph. Each bike hits its speed limiter without any problems, with the BMW having the most aggressive cut in power once you reach the limit. Despite the breathtaking speed, the Kawasaki and Suzuki are actually stable. If you’re brave enough you can relax, loosen your grip and just enjoy the sensation of speed. It’s easy to get tucked in on both bikes, and it doesn’t actually feel that fast down when travelling down a very wide two-mile runway. The BMW is a little less stable, but for a sportsbike it’s impressive, and the small bodywork is much more effective than it looks. We know from previous tests that both the Busa and ZZR will top a true 200mph once de-restricted, and that a BMW S1000RR with minimal modification for superstock racing will cut through the speed trap at over 190mph. But restricted top-speed runs only tell us a fraction of the story. To discover the true king of speed we need to look at acceleration. At drag strips around the world, Suzuki’s Hayabusa has always been the favoured weapon of choice, usually with an extended swingarm for stability, a capacity increase and even sometimes a turbo. The true acceleration test is the standing quarter-mile, and has been since man invented the combustion engine. The Kawasaki’s time of under 10 seconds is almost unbelievable for a stock road bike on standard rubber. Some purpose-built drag bikes struggle to break the magic 10 seconds, regarded as the benchmark time by many. The Kawasaki’s time was one of the fastest we’ve ever recorded at MCN. The BMW and Busa are not far behind, impressive in their own right, but you can’t argue with the winner. Interestingly all three bikes come with ABS, which we left on for the purpose of our test of each bike’s braking distance from 70mph to 0mph. The Suzuki has had radial Brembo calipers since 2013, but still can’t match the stopping power of the Kawasaki. It’s not really a surprise to learn that the BMW comes out on top – it’s significantly lighter then the Busa or ZZR (by almost 70kg). But considering its extra bulk the Kawasaki it isn’t far behind, only taking half a metre more to stop. We can categorically say we have a clear king of speed – Kawasaki’s ZZR1400.  I can already hear protests from the Hayabusa fans, and I know the dedicated fans of Suzuki’s legendary bike will be disappointed – but you can’t argue with an objective scientific test. Kawasaki’s ZZR1400 is the quickest bike here. BMW’s HP4 has pushed the limits of what’s achievable from an inline 1000cc motor, it’s barely a metre off the ZZR at times. The HP4 is the quickest, most advanced 1000cc inline four we have ever tested, but if you want the fastest production bike on the planet in 2014, you’ve got to choose green.